Q: Can it be done... a landscape transformation on a budget? If so, what are some ideas to keep costs in check and still produce big results? We get asked this question all the time. The short answer is “yes” but is always followed with the question of “how?” The first thing I tell people is not to allow budget to hamper the creative process. It is important to know what you want before you can analyze the economics. It is very difficult to put a dollar sign on a question mark. When you know what elements you want in your landscape, then you can start to determine how each element can be scrutinized individually or if some items can be put off until a later date. This brings up the first way to keep costs under control – phasing. Phasing is a major tool that can see a project completed over time. A note about phasing: It is very important to take the entire project into consideration when deciding what must be built first so you do not un-do work later in order to add elements that should have been constructed first. An example of this is scheduling hardscapes like driveways and patios before plants and turf. It sounds simple but people love plants and flowers and tend to focus on these elements and rush into a planting plan before the stationary elements of the plan are completed. Phasing can be all about delayed gratification. Another way to control costs is to evaluate materials and choose a suitable product that satisfies the landscape plan but may not be your first or favorite choice. An example we see a lot is the all-important pathway that leads from one area of the plan to another. Everyone loves the idea of pavers, but after seeing the price for that option, decorative gravel may be the better choice. A common method we use to save money goes back to the delayed gratification philosophy. Instead of getting the large spruce tree that anchors the corner of the house and the full shrubs that give the impression of a fully mature landscape, use smaller-sized plants and let the Alaska summer sun work on growing your landscape into a mature garden over time. It doesn’t take too long up here. 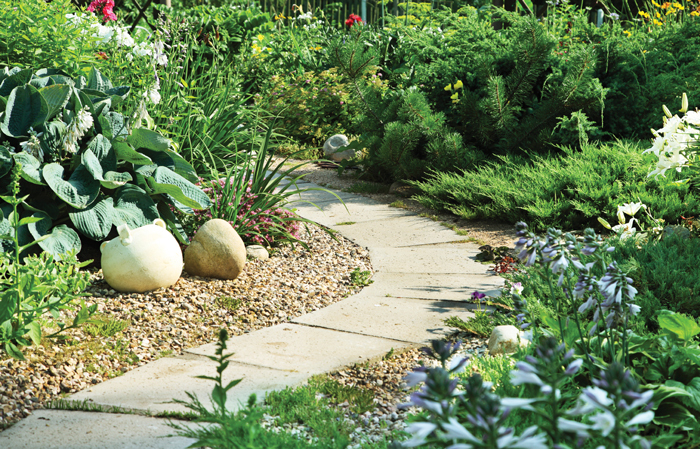 You may actually save enough to turn that gravel pathway into a flagstone walkway. Finally, a bit of cautionary advice for people trying to save money using the DIY method: Be as educated on proper installation techniques as possible or your project may end up costing more in the long run if not executed well. Do-it-yourselfers are an extremely versatile group but we suggest asking for help and understanding the scope before jumping in with both feet. Sometimes a professional landscape designer and crew can save big bucks in the long run. Otherwise, it is the perfect way to get a landscape finished under budget. Benjamin Brown, the lead designer with Faltz Landscaping & Nursery, has 25 years of experience as a landscape designer. For information, visit faltzland.com.